What does it mean to team up? It means to join together to launch a product or band together and do something great for the community. Last night at the IOA Corporate 5k, 17,491 runners and walkers representing 750 corporations and non-profit organizations teamed up and demonstrated just that! 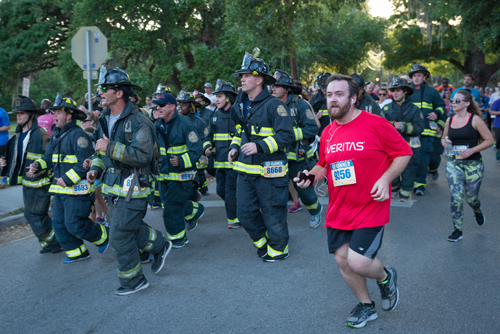 Approximately 30 Orlando Firefighters truly teamed up and ran the 5k in cadence. 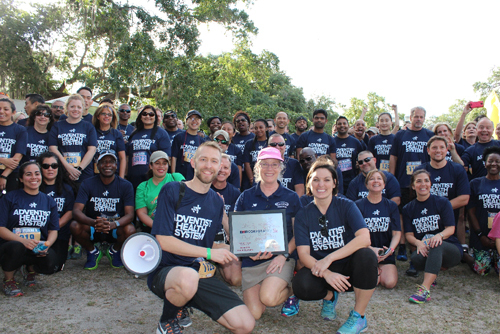 Adventist Health System teamed up to win the IOA Team Spirit Award as the largest company with 700 runners and walkers. IOA Corporate 5k teams rallied together and contributed food and funds to the 100 Meal Team Challenge, surpassing the 25,000 meal goal and contributing 80,000 meals (and counting) to Second Harvest Food Bank and the Christian Service Center. This is an amazing example of what is accomplished when we team up! First time IOA Corporate 5k runner Joe Farrand recently moved here from Kansas to work (and run) with the Rosemont Elementary running Eagles. He won in a time of 15:44. In 2015, Principal Patty Harrelson was the Female CEO winner. "Joe is an incredibly talented music teacher, and a gifted athlete. He is a beloved member of the Rosemont Elementary family, and the fact that he runs a 15 minute 5K just adds to his awesomeness, says Harrelson." Ragnhild Kvarberg, with Aerodyne, a mother of three on a family vacation from Norway ran a blistering time of 16:48 to become our IOA Corporate 5k female champion! Hats off to all our team captains who work tirelessly during IOA Corporate 5k season to gently encourage their co-workers to join the company team and participate, many for the first time.